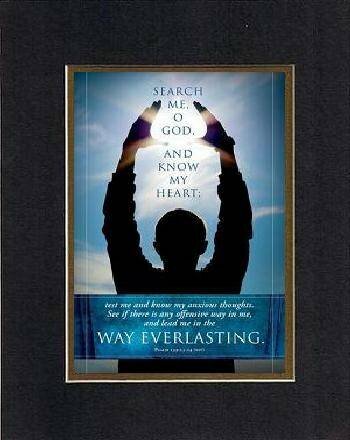 ***CAPTION*** Search me, O God, and know my heart; test me and know my anxious thoughts. See if there is any offensive way in me, and lead me in the way everlasting. Psalm 139:23-24 (NIV) ---- Give it as-is or use it as a substitute to ordinary blank greeting card. It is such a beautiful way to convey your message for the special moment and occasion. We suggest using special Silver Metallic Colored-Ink pen to write your message, sign and date for added value as keepsake. Enhance the presentation of your message with a frame that can be displayed for years to come. Unlike giving the conventional greeting card, your message will not risk being tossed or put away in file drawers. A unique and/or perfect medium for your message to the ones you love.